The Green Lanterns are an intergalactic police force of sorts that are run by the ancient Guardians of the Galaxy from the planet Oa. The Green Lanterns' major tool is their power ring, which can do what ever its wearer wishes, except to anything of the color yellow (a safeguard that no one lantern shall become too powerful). These rings are powered by a giant lantern shaped battery on Oa. Each sector of the universe has a Green Lantern. Green Lantern (sometimes called The Green Lantern in the early days) was created by Martin Nodell and Bill Finger and first appeared in All-American Comics #16 (1940). This Green Lantern was Alan Scott, an engineer who had come into possession of a magic lantern. From this he crafted a power ring which gave him a wide variety of powers, and which had to be charged every 24 hours by touching it to the lantern for a time. Scott was a founding member of the Justice Society of America, and starred in his own title, Green Lantern, during the 1940s. His adventures during the Golden Age of comic books came to an end when superheroes fell into disfavor in the industry in the early 1950s, when the JSA's adventures ended with All-Star Comics #57 (1951). A few years later, DC Comics had successfully revived The Flash in a new incarnation, with the name and powers being used by an entirely new character, and it was decided that Green Lantern would be similarly revived. This Green Lantern was Hal Jordan, a test pilot who was given the ring by a dying alien, Abin Sur, and who became a member of the Green Lantern Corps, an interstellar organization of police overseen by the Guardians of the Universe. The Corps' rings were powerless against anything colored yellow. Jordan's creation was motivated by a desire to make him more of a science fiction hero (editor Julius Schwartz being a longtime SF fan and literary agent) to boost sales. The Green Lantern Corps bears many similarities to the Lensmen from the stories of E.E. Doc Smith. The Lensmen, who hail from various alien races, bear a device known as the Lens which gives them enhanced physical and mental abilities, bequeathed to them by the advanced and benevolent Arisians. The Lensmen are the vanguard of the Galactic Patrol, an interstellar police force. However, both John Broome, writer of the early Hal Jordan tales, and Schwartz denied any connection. Broome, in particular, denied all knowledge of Smith's stories. Schwartz also denied reading them, although he admitted that, as an SF fan, he had of course heard of them. This Green Lantern was a member of the Justice League of America and starred in his own title, and eventually met his predecessor, who was established to live on the parallel world of Earth-Two, separate from Jordan's Earth-One. The two Lanterns struck up a close friendship and periodically come to each other's aid in various adventures. This new Green Lantern also became best friends with The Flash and the two heroes appeared frequently in each other's comics to team-up. By the late 1960s, however, Green Lantern's popularity was flagging. New Green Lantern creators Denny O'Neil and Neal Adams attempted to spark new interest in the book by adding the character Green Arrow to the series, and having them travel through America encountering various "real world" issues, to which they reacted in different ways, Green Lantern being fundamentally a lawman while Green Arrow was a liberal iconoclast. The experiment was years ahead of its time, on the strength of Adams' stunning detailed and dramatic artwork and O'Neil's intelligent and thought provoking (but often heavy-handed) stories, and was not a commercial success. DC editor Julius Schwartz dubbed it "relevance" and the Adams/O'Neil era was one of the earliest efforts of comic books to become more than light fantasy. Finally cancelled in 1972, the character became the back-up feature in The Flash until 1976, when Green Lantern/Green Arrow was relaunched minus the "relevance" of its previous incarnation. By the eighties, Green Arrow left the title as the focus gradually shifted from Hal Jordan to the Green Lantern Corps as a whole. After being exiled to space for a couple years, Jordan gave up his ring for a time and his role was assumed by fellow Earthman John Stewart, who had been introduced by O'Neil & Adams years earlier during the "relevance" era. Stewart was soon followed by yet another Green Lantern of Earth, Guy Gardner, created during the sixties to serve as Jordan's back-up within the GL Corps. 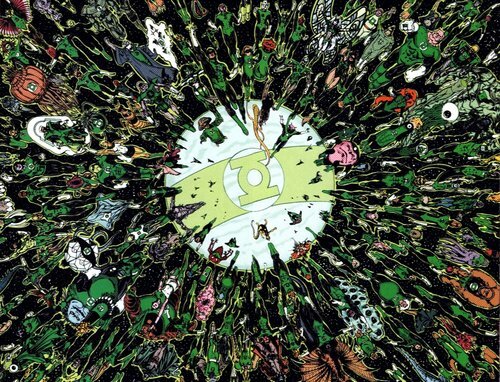 After Jordan took up the ring again, he was joined by a legion of other Green Lanterns, both human and alien. Few storylines in comics history provoked as much outrage and controversy as when DC editor Kevin Dooley had writer Ron Marz write Emerald Twilight, detailing Jordan's descent into villiany. Sales had slumped again by the 1990's and an editorial decision was made to restart Green Lantern as a younger different character. In the story Jordan went insane following the destruction of his old home, Coast City, by the villainous alien Mongul. Jordan destroyed the Green Lantern Corps and the Guardians, absorbing their power and taking the name Parallax. One Guardian survived, however, and passed one remaining ring on to a randomly-chosen human named Kyle Rayner. This ring lacked the flaws of the earlier rings, and Rayner joined a new incarnation of the Justice League. Hal Jordan eventually returned as Green Lantern, and was cleared of the crimes committed as Parallax in a 2005 miniseries called Green Lantern: Rebirth that revealed that it was the work of a cosmic fear parasite that possessed Jordan. I would like the thank Wikipedia, the free encyclopedia, for the Publication History.